Summary: Angus Council commissioned a team led by the excellent Pidgin Perfect to deliver the Forfar Town Centre Charrette – Future Forfar. The town centre charrette was a series of creative conversations, activities and events exploring the future of Forfar Town centre. The Pidgin Perfect team was supplemented by Nick Wright Planning and WMUD and supported by consultants Professor Leigh Sparks of Stirling University, Arts Curator Patricia Fleming and Matt Bridgestock of John Gilbert Architects. An intensive Pre-charrette phase of public engagement information gathering and preparation took place from the start of October 2015 through till the launch of the three day charrette on Sunday 22 November in the Future Forfar Cafe at 3 East High Street, featuring live performances from DD8 music amidst an exhibition of Forfar’s history and heritage from Pitstop. The charrette concluded with presentations on visions for Future Forfar in the Future Forfar Workshop in the Drama Society space at 132 East High Street. During the town centre charrette we received a huge number of great ideas and had passionate discussions with a wide range of individuals, organisations and stakeholders. The result was an overarching vision that everyone committed to push forward on. 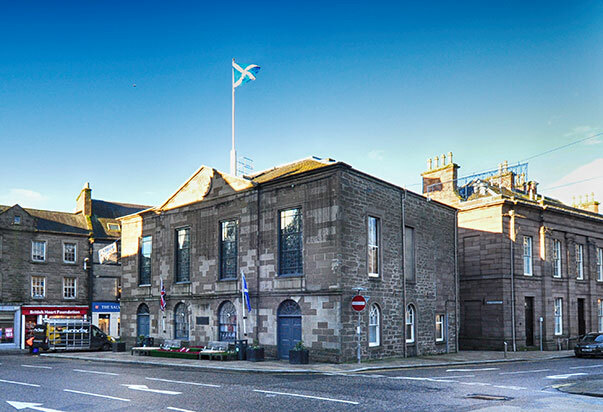 A Distinctive Character by enhancing Forfar’s underlying unique features such as buildings, shopfronts and streetscape. A Forfar for All Generations by creating affordable spaces for all age groups Forfar is home to people of all ages. For the town centre to thrive in the future, it needs to offer something to all these different generations. For example, kids have nowhere indoors to go without having to spend money. Young adults have difficulty getting one or two bedroomed homes, the kind of development that is ideally located in the town centre. In the evenings, people of all ages have lots of organised groups to choose from – but the choice of restaurants, bars or cafes is more limited. Consolidating the Centre by making the Cross and town centre a focus for the local community – there was a strong desire from charrette participants to make the town centre more of a focus for the local community. This includes creating a central place for the community to meet and call its own, an important concept but one which needs more detailed work. Complementing that is a year-long town centre events programme and, in the long term, focussing future growth and investment on the town centre. Better Communication and Coordination between all local partners on what’s happening in Forfar and greater promotion to the wider world Forfar has a lot going on, but not everyone knows. 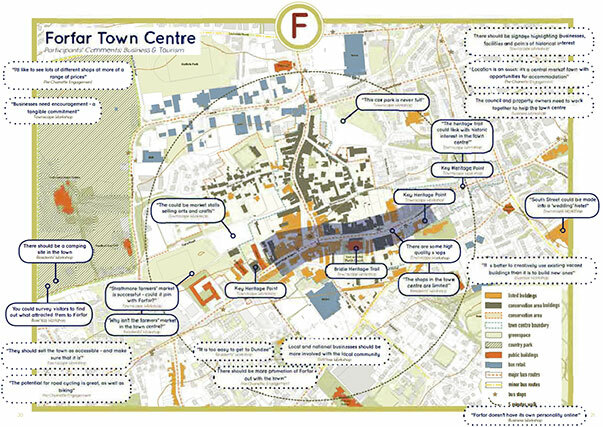 To revitalise the town centre, residents need to know what there is to attract them into town. Community groups, businesses, social enterprises, the Council and its Community Planning partners need to share and co-ordinate what they’re doing. And, beyond all that, Forfar needs to communicate what it has to offer the wider world. 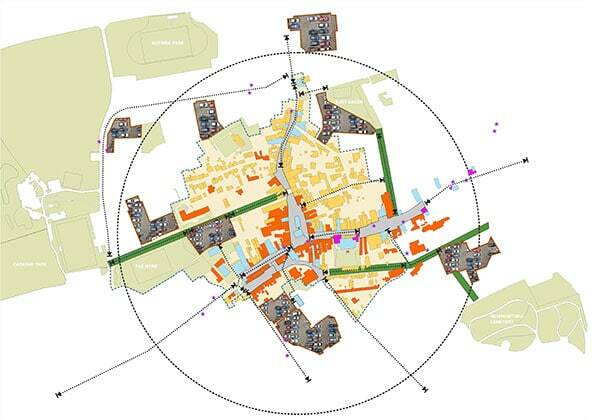 The physical ideas focused around the Cross in the town centre and along East/West High Street. Willie Miller Urban Design developed proposals based on ideas and suggestions that came up during the Charrette. We proposed a low speed environment along East High Street to slow and narrow down traffic and offer a more flexible civic space around the busy bus station. As a major arrival point for Forfar this area could benefit from a more civic and friendlier environment to encourage people to stay and enjoy the town. The idea of a Central Community Hub for Forfar where people can meet, events can be held and start-up businesses can be developed came up strongly during the Charrette. As there isn’t really a space like this at the moment we proposed the vicinity around the Cross as a potential future Hub area with the current Access Office could be re-used as a community facility. Castle Street just west of this potential Hub building could become an area which can be temporarily closed off for traffic for events like markets or festivals. This would have to be tested and if it is working well for Forfar and its’ residents there could also be a roads surface change to low-speed environment.